Sometime in 1980 one of the most successful software companies, Neotech Corporation developed several types of software and hardware designed to control the human mind, meanwhile somewhere in Tokyo a rival yet secret company developed their own strategy to fight the rising tech oppressor, Neotech. The details of the plan to combat Neotech were recorded on a VHS, which was programmed to release the details on a future date through a software Glitch known as the VHS Glitch. 2014 was the year the Glitch cipher was revealed. The war is on. Please stand by. Years ago the Glitch revealed its existence on social media by releasing some amazing computer generated sounds that were later discovered to possibly be the foundation of the war against Neotech. VHS Glitch communicates via social media and e-mail. There are no pictures, no gender; nothing indicating that VHS is a human being. VHS Glitch could very well be an advanced form of artificial intelligence? Glitch communicates like a human but offers no empirical evidence of actually being human. VHS Glitch has a growing fanbase. With no real marketing and a DIY mindset, it’s amazing how many quality releases the Glitch has put together. Werkstatt Recordings was the first to take a chance on the ghost in the machine VHS Glitch. Werkstatt is well known in the synthwave and Italodisco scenes for their contributions both digitally and physically. You better be fast if you like something in physical form, as their releases are very limited. VHS Glitch had its debut album “Evil Technology’ released on Werkstatt only to sell out 2 pressings in hours. Nearly two years have passed since the digital debut of ‘Evil Technology’ along with several releases since. I believe the VHS Glitch infiltrated my Mac Book with a message to the human fan base. The following is my conversation with the Glitch. Greetings Glitch! Thanks for taking some time out of your day to talk VHS Glitch and beyond. I know you are really excited about your upcoming release of last year's digital album 'Halloween Strangers' in physical format. Tell us about the album and how you hooked up with Gohan Tapes. VHS Glitch: "Halloween Strangers" album was composed in 28 days last Halloween and was released on digital format on my Bandcamp. For the cassette release, I kept all of the original songs except one, 'crime scene' which will be included on the extended version and I will also add a couple of exclusive songs. I hooked up with Gohan Tapes due to one of the owners that sent me the first release of the label which was an album composed by him, Nedavine, and his partner Ally Mobbs (make sure you check out Nedemo). I loved the album, so I started a conversation with him about it and ended up with an offer from them to release at least one of my albums. After a couple of negotiations we signed the deal for the "Halloween Strangers" cassette release. You have had great success selling your previous releases. A few days ago, 'Land With No Future' vinyl LP became sold out. This was a release you did for the fans. What led you to doing this vinyl LP, especially since it was not something you were going to turn any profit on? It must be very flattering knowing the fans truly dig your music enough to sell out of the stock? VHS Glitch: As I constantly say on my Facebook page, VHS Glitch is more than my compositions. This project is being built based on my listeners support, I'm a independent artist, I work alone, I made my own graphics, compositions, mixes and mastering, so if it wasn't for my listeners support, sharing all of my works, I wouldn't sell a single album. So as you can see it is not so hard to sacrifice some money for a crowd like mine. It's a fact that I could reinvest that money on future releases BUT I will find a way to recover that money doing any other activity. I wish things were different and I could be able to make a vinyl release getting what it is mine, but this is part of the sad/dark side of the independent liberty. Sold out in a month and a half without any kind of marketing or support from the media is definitely something that sounds impossible, but it happened. It feels so good to see that almost all the listeners that asked for a vinyl release bought it instantly. As I mentioned before this is not a regular artist thing, VHS Glitch is a real community of honest listeners and we can see it is 100% true with things like that. 'Evil Technology' was your debut album. It was released back in 2014 digitally. There was a lot of praise, and the fans wanted a physical release. You eventually hooked up with Werkstatt Recordings in Greece. They have an impressive roster of releases. What led you to signing with Werkstatt? Also, you ultimately made 3 pressings of 'Evil Technology'. All pressings sold out immediately. Any plans for some 'Evil Technology' on vinyl? VHS Glitch: Werkstatt Recordings is one of those labels that really understand the independent artist struggle and respect the synth scene. They have been putting a lot of work and money behind the label so they know they have to do things right with the artists because at the end of the day they are doing the same thing by investing time and money. I signed with them to release just one short run of "Evil Technology" tapes for the listeners that asked for it but we sold out in matter of hours so we decided to talk about making another run which ended up in two of them that sold out in matter of hours as well. I have to say that I have nothing but respect for the label and I truly appreciate the way he worked with me. They were so professional and I haven't any problems with them (which sadly it is a hard thing to find nowadays). Sadly there are no plans for a vinyl version of Evil Technology. If it was up to me, I would make a 500 copies run, but sadly I can't make that happen... If it will be in any plans for the future I will definitely notify it on my Facebook page. Another impossible to find physical release of yours is 'Night On Dark Hill' mini album on cassette. Any plans to reissue this? VHS Glitch: Maybe in a near future... Not sure yet but it could be nice. It was a pretty short run and also sold out in hours so I guess a lot of people missed it. I will see what can I do. How important is image to you? In the synthwave / retrowave worlds there is a lot 80's revelry, like the VHS player, bright colors, synths, cars, Stallone, Arnold, ninjas etc. How do you come up with your art concepts? You also have short essays describing the album's concept. Very 80's! I see this more and more. It adds to the mystery and intrigue of the artist's mindset. VHS Glitch: In my opinion, it is part of the project. I don't make any difference between image and music. For me is like a whole package. I have to say that I'm feeling less obsessed with the image right now due to I'm trying to avoid clichés. Well, since I compose my music based on stories, images, landscapes, atmospheres, situations, that I have on mind, I just have to put them together on a digital canvas, I don't have to overthink it. I just have to follow the stuff included on the descriptions you are talking about. I really love to explain as much as possible regarding the concept behind the album using art, writing, or whatever I need to put everyone into the right mood before the listening session. Who inspired you to become VHS Glitch? Where did it all start for you? VHS Glitch: My creators are from Japan. They recorded the best of the 80's on my system. I was programmed to do everything you all can see, graphics, videos, music, etc. It is part of me; I need to do this all the time. It’s like my fuel. When you look at how fast your releases sold out, and then take a look at the next level with well-known acts Carpenter Brut and Pertubator - and how fast their vinyl sells out, the market, although saturated is pretty good for quality releases. Are synthwave fans just buying everything or do you think with all the sites like bandcamp, the fan can really gauge how good an artist's music is and in turn will buy quality music over generic average output? VHS Glitch: Once again I can only speak about my work and my listeners and I can certify that I only release what the listeners ask for and they only buy what they like. Some of my listeners don't like to buy digital so they wait for the physical, and some of them like cassettes more than vinyl and vice versa. As I mentioned before my listeners are 100% honest with their actions. They are not following a superstar or a personality or a specific image, they are following the VHS Glitch project because they like what they hear and see. Have you thought about adding vocals to any of your upcoming tracks? I think your music is strong enough to stand on its own, but perhaps an experiment with vocals is something you have thought of? Also, you have worked with other artists. Who would you like to collaborate with in the future and why? VHS Glitch: It is something that I would love to do and I will definitely try to make it happen in the future. It is always good to add some vocals somewhere on an album track list to balance the different atmospheres during the listening. I have worked with some other artists but sadly it is something that I'm not used to doing due to my lone wolf setup. Anyway, I enjoyed writing on the couple of collaborations I did. 'Land With No Future' and Gunship's debut album were, and are two of my personal favorites of 2015. What were some of your favorites of 2015 and why? VHS Glitch: Dynatron's ‘Aeternus’, because his sound it's so personal and defined and this album definitely reflects that in the best way possible. Ex Machina's ‘Transhuman’, because he is definitely a very underrated synth artist that has a lot of talent. It is an album full of different atmospheres and vibes and it is something that I appreciate so much. Waveshaper's ‘Exploration 84’, because his music sounds like the "original" synthwave sound from back in 2012/2013. He is keeping the essence alive and refreshing it at the same time. Power Glove's ‘EP2’, as a music lover and as a composer who doesn’t like to be tagged/attached to any genre, this album represents that synth music doesn't need to follow any patterns or rules. Also it shows the listener that Power Glove can compose more than just one specific sound and their versatility is another thing that I appreciate and respect so much in an artist. John Carpenter's ‘Lost Theme’, just because. I know the fans mean everything to you. You respond personally to every post on social media, and I'm sure you do the same via e-mail. You have even named your fanbase the 'Glitch Army'. What's the best part as musician when it comes to the fans? What moves you? VHS Glitch: I definitely do that via e-mail as well. It is definitely the least I can do for the Glitch Army soldiers. The best part is to receive feedback from people who want to explain to you their feelings while listening to any of your compositions or albums and realize that a huge percentage of the times that happen they feel or imagine close images, scenarios, situations, feelings as the ones you imagined while writing the song. It feels like magic! I also love when you realize that your music is being played from Australia to Iceland and from USA to Russia. It feels so good to know that your music is almost all over the world. What listeners or fans or whatever you want to call them mean to me… It’s impossible to explain. If you think about it deeper and slowly, we are talking about people that are following just my music and my art. They don't know a single thing about who is behind the VHS Glitch project. They don't know how I look, where I'm from, my name, how I dress... They don't have a celebrity to follow; they are following pure art, nothing else... That explains a lot about the Glitch Army, as you can see it is something absolutely pure and honest and that's why I keep everything low key. At the end of the day what really matters in art is the art. I always leave the last question for the artist to include anything else they wish to include. Keep up the good work! Cheers for the time! VHS Glitch: Thanks a lot Luke for this amazing interview. I really enjoyed answering your questions, and it was a pleasure. 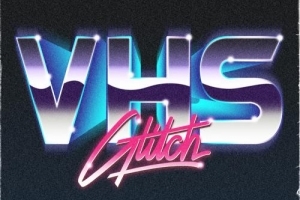 I wanna say thanks a lot to the whole Glitch Army for being awesome and so supportive and also invite the readers of this interview that maybe don't know about me to check out my Bandcamp http://vhsglitch.bandcamp.com in case you want to know some more about VHS Glitch.